A cable cross and lat pull down machine offers a great workout—and you can find one at your local Y. This move helps strengthen rotator cuffs in your shoulders. Select the weight you’d like to use (suggest 5-15 pounds). Adjust the handle of the cable cross so it is aligned with your elbows while arms are at rest. Place a small hand towel between your right elbow and rib cage. Grasp the cable cross handle with your right hand. Rotate your right forearm out while keeping your elbow pressed against the towel. Do 10-15 reps of this exercise. This exercise works the latissimus dorsi (lat) muscles in your shoulders. Select the weight you’d like to use. Take a seat on the chair attached to the lat pull down. Place your hands shoulder-width apart on the bar above. Stabilize your shoulders by bringing them down and slightly back before performing the movement. Pull the bar down below your chin and neck—just above your chest. In addition to exercising lats and serratus anterior in your shoulders, this move works abdominal muscles. Stand an arm’s-length away from the lat pull down, with your feet hip-width apart. Make sure the bar is no higher than your shoulders. Place your hands shoulder-width apart on the bar in front of you. Press the bar down toward your waist. This exercise works lat muscles in your shoulders, rhomboids and trapezius in your upper back and biceps in your upper-arms. Stand with feet hip-width apart and a slight bend in your knees. Grab the cable cross handle with one hand. Pull the handle straight back toward your rib cage. Dru suggests incorporating this quick strength-training workout into your fitness routine 2-3 times a week. 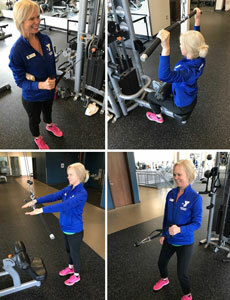 For more help on strength training your upper body, you can meet with a Personal Trainer to get a customized exercise plan, or drop into strength-focused Group Exercise classes at the Y.